It’s good to play for a winner, even when “you’re here to be the loser” and no matter how many times you die. There’s no place Marsden, whose character dies regularly on the show, would rather be right now. Being part of a show that’s been nominated for 22 Emmys — tied with “Saturday Night Live” for the most this year — can have that effect. The “Westworld” leading man, 43, receives a lot of attention for his — let’s just call it what it is — perfect face. But, he told AOL Entertainment, he’s come to realize that when men say, “My wife has a crush on you,” it’s sometimes a bit of a cover. Jimmy attended Comic-Con International 2017 in San Diego on July 22, 2017. I’ve uploaded 59 HQ photos to the gallery. In the midst of the huge crowds, action-packed panels and entertainment installations at San Diego Comic-Con, James Marsden and Joel McHale waged a “war” over an “age-old” debate: whether Nacho Cheese or Cool Ranch Doritos are better. James Marsden: We are coaching two volunteer teams assembled. Joel’s team is Cool Ranch. My team is Nacho Cheese, we’re basically doing the Lord’s work today. With the world’s largest entertainment conference as a backdrop, Doritos hosted the “Bold or Boom Challenge” – an obstacle-course of epic proportions pitting celebrities and fans in an arena in which only the boldest prevailed. 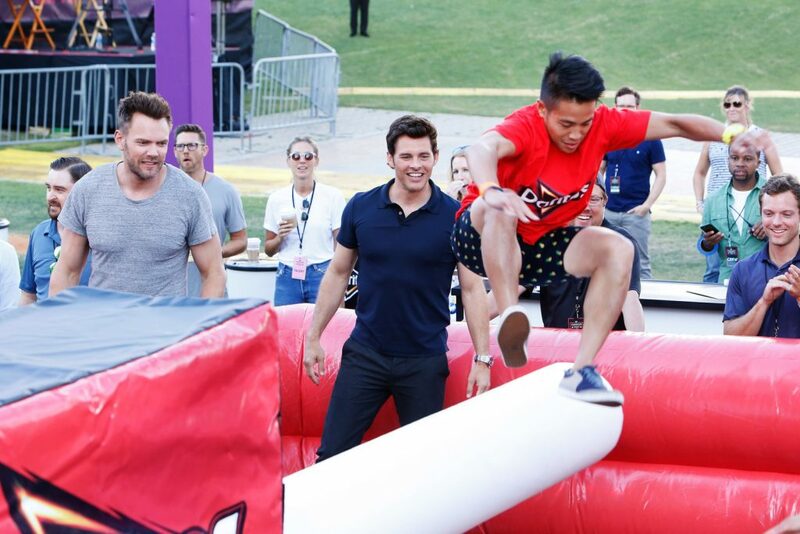 Headlining the festivities were celebrity captains including Team Nacho Cheese’s James Marsden and Team Cool Ranch leader Joel McHale. It was Team Nacho Cheese that prevailed, a boon for Doritos Nacho Cheese fans nationwide who witnessed the challenge on Doritos’ social media channels. For one week at least, the debate was settled between fans of Doritos Nacho Cheese and fans of Doritos Cool Ranch. The challenge was open to fans who wanted to test their endurance and skill to see who could stay standing as rotating “boom” arms attempted to knock them off course. Only the boldest participants remained. I’ve uploaded scans from an old issue of Popular Cinema (China) Magazine to the gallery. Jimmy attended HBO’s “Westworld” FYC panel at the Saban Media Center in North Hollywood yesterday. I’ve uploaded 23 HQ photos to the gallery. Jimmy attended the Monaco Formula 1 Grand Prix at the Monaco street circuit in Monaco on May 28, 2017. I’ve uploaded 24 HQ photos from this event to the gallery.